Pricing is very competitive, and a great value compared to Constant Contact, etc. At the end of the day, deliverability of email is the only metric that really matters. We have emailed through a few services, and the open and click rates with SendinBlue are better than with any other service we have tried. Fantastic landing page and email builder. Great handling of email sending, bounce and traffic. Great website website analysis tools. As a company, Act-On is always willing and eager to listen to customer feedback and incorporate it into the product. Customer service at SendinBlue is outstanding. Eric is always available by phone to help with any issues that we have. The SendinBlue platform is intuitive and easy to use. 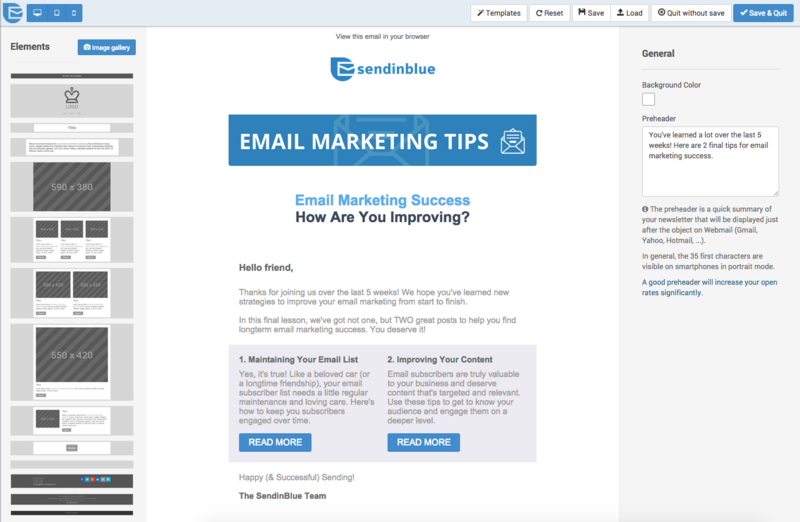 Our email gets opened and read when we use SendinBlue. Lowest price tier is too expensive for light users. We have to use the credit system and thus to separate the personal and the newsletter accounts and that is inconvenient. Love the product, love the support.Easy to use. Just trained my newest staff member how to use it. Without watching the videos (she will), she has already designed an email, form, programmed the lead flow and scheduled the blast....in one week. Great value, ease of use, efficient, great open rates. Act-On Customer Support is always there when I need them. They are always able to solve all of my problems and walk me through anything I need help with. They are always very patient and thorough. Their great attention to detail helps ensure all of my questions about automated programs or anything else are solved correctly. These people helped me identify errors when setting up DKIM and were more than helpful in trying to diagnose low open rates with a few campaigns identifying where improvement can be made and how to more effectively manage contact lists. The support is excellent. Trust your success counselor. All 3 had have been spectacular. I kind of already covered this in my previous response.Manticore - Nice people, product didn't integrate with Oracle CRM, used it for email blasting only. Such a disappointment on the integration.Oracle CRM Marketing Automation - Good product, I believe it's being phased out since they purchased Eloqua. Long wait on support. I can't recommend it based on this. Hire a consultant to help you get started which adds to your expense.Evaluated:Marketo - VERY detailed, did cool stuff, but lots to program and set up. More than we needed and I didn't have time to spend that much time programming it.Eloqua - Okay product - some good stuff here, but sales rep. was rough. Based on previous experience with Oracle support, it was ruled out.Pardot - Good product, good sales team, seriously considered it. Plus, SF.com owns them which meant it will easily integrate with SF.com. Support - fill out the form was the tie breaker. There were a few other things Act-On shared with me that also tipped the scales as well. Improved market segmentation leading to improved leads/sales/roi for the sales team. Provides great insight into use interaction and behavior. Forms and landing pages allow you to create unique customer service tools and automated emails for customer service. Deliverability: SIB protects their sending IP and this shows with the rate of delivery. Junk senders are cautioned, this is not the solution for you. Simplicity: Cut the time it takes to get professional email campaigns out to your audience. Less time = less labor expense. All in one solution allows you to capture and maintain both SMTP and SMS under one program and this has made segmentation and campaigning less annoying and tedious.